Using OAUTH2 with a webapp published 'as me' showed how to create tokens in the context of a webapp which accessed resources belonging to me (the script owner). This would be useful in the case where I was giving other users access to my resources via my webapp, without needing to give them them permission to access the resources directly. 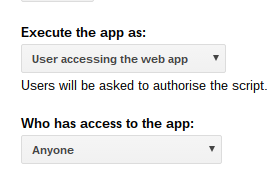 The next scenario, is where the webapp needs to access resources belong to the user that is running it. In this case, every user who runs the webapp will not only need to give the webapp authorization (for example to access files on his Drive), but the webapp will will also need to maintain a separate token refresh environment for each individual user. Goa should be instructed to store the token infrastructure in the userPropertyStore rather that the scriptPropertyStore. The project credentials are stored in the scriptPropertyStore and Goa will clone them to the userPropertyStore as required (if they change .. for example a new scope, or on the first time a particular user is encountered). The webapp will be published as follows. In order to make this example a little more realistic for the scenario, I'll show you how to use the googlePicker in this webapp, which will allow the user to select folders on their Drive for processing by the webapp. Although this makes it more complicated to compare the two scenarios, I think it's important to demonstrate why there would be a need for the different scenarios, and accessing the user's drive (as as user) versus the script owners (as me) drive is a good illustration. 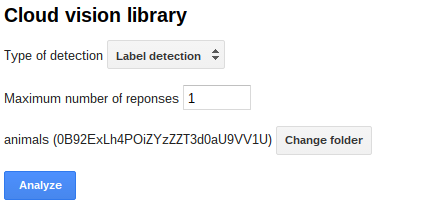 where the 'Change folder' buttons launches the googlePicker, from which the user can select the folder to process,as below. All the demo code is available on github. The credentials are the same as the ones used in Using OAUTH2 with a webapp published 'as me'. No changes are required. The credentials are stored in the same way as the ones used in Using OAUTH2 with a webapp published 'as me', except that the oneoff function to initially create them has a couple of changes - not related to running as 'user' as opposed to running as 'me', but needed because I want to be able to use the Picker API to enhance the example. 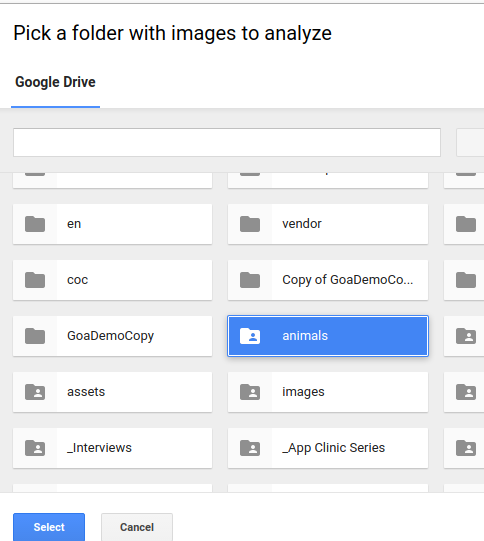 apiKey:'AIzxxxxxxGvZKbdg' // you can store arbirary properties in goa too. I've added the drive scope, and also a new property called apiKey. Picker doesn't have any scope of its own, but will need Drive scope to be able to access the user's drive. The picker needs an API key in addition to Oauth2 authorization. 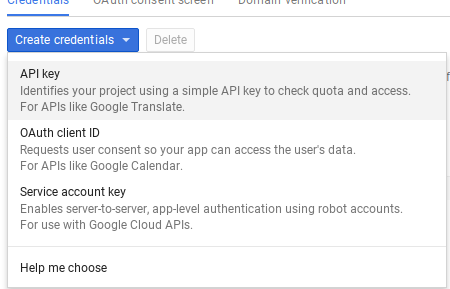 An API key can be created in the developers console in the cloud vision project, as described below. Goa is able to retrieve any arbitrary properties in addition to the ones it needs for working with tokens, so I'll store the API key here too and get it later when needed. Some APIs need an API key to measure usage. An API key can also be assigned a domain from which to expect requests using this key- which means that if someone gets hold of your key he would need to issue requests from a registered domain to be able to use it. Of course, in the case of Apps Script, all requests come from Google, so it doesn't help too much. 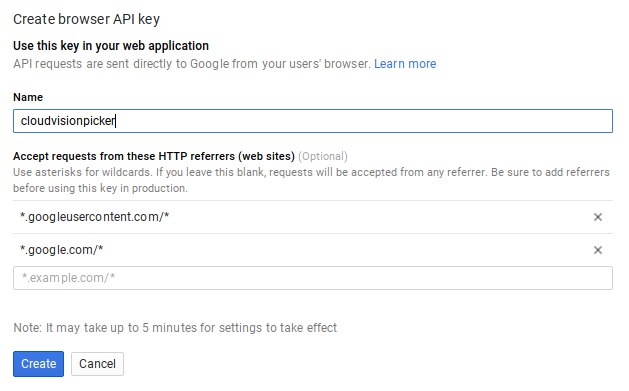 In any case, here's how to create an API Key. In the credentials area of your developer console entry for the cloud vision project (the one you enabled the cloudvision API in). Store the API key in the goa one off script and execute it to write the whole thing away for later. 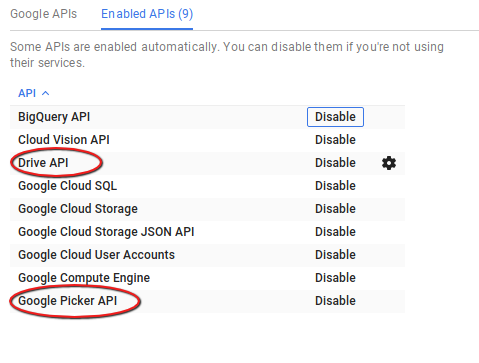 Since I want to enhance this project by including the Picker, I also need to enable the Drive API and the Picker API in the developers console in the project created for this cloudvision project. The entire code for the web app is too long to publish here, but all the examples for each of the scenarios are on github. I'll just focus on the key points in this post. Since I'm using the same webApp for the 'as me' version, and the enhanced 'as user' version, I'll need to introduce some parameterization. Here's the updated doGet function from the webApp in full. 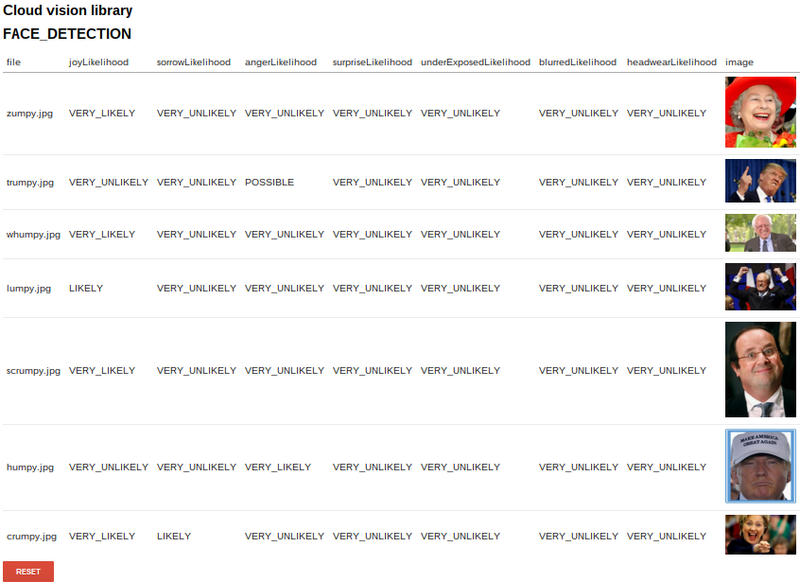 Here's the parameterization, for the two flavors of webapp. Of course you wouldn't normally need this. The key difference between the two versions is that I'm using a different html file - largely because the 'as user' version uses the picker to identify which folder to access. Aside from the parametrization, the only difference between this pattern and the one used in Using OAUTH2 with a webapp published 'as me' is that I am using the userPropertyStore to keep the token infrastructure in. That means I need to handle cloning the credentials as new users come along. Goa takes care of all of that by cloning the package from the scriptProperties to the userProperties as needed. This code needs to be at the start of the pattern to make that happen. From then on, all interaction is with the UserProperties. The picker runs client side, and is included in the asuser html file as follows. The Google jsapi library is also needed. The mainasuser.js html file is also slightly different as it loads the picker code from the Google API as follows, then initializes the App when it is completely loaded. The picker code itself is actually quite simple, although it could be improved by playing around with the (very complicated) extensive options that the picker API offers. Since the picker is invoked client side, it needs a way to get the api key and oauth token from the server and ensure they are fresh. This method is in the Client namespace. Which as usual, asks the Server namespace to do something on its behalf - namely to get a token and an apikey that can be used with the picker. All this is kicked off by listening for a click on the Change folder button, and the selected folder details are displayed and stored in the folder controls.